The first two posts in the Wixie training series focused on ensuring that teachers have a clear idea of why to use Wixie and what students can do with it as well as introduced teachers to Wixie's student authoring tools.. The next step is to build awareness and confidence in using Wixie's teacher tools. A great place to start is with the curriculum library and assignment feature. Wixie’s Curriculum Library includes hundreds of standards-based activities. Teachers can customize and assign these activities to specific students in their classes and provide feedback as the students are working. Have teachers log in to their Wixie accounts. If they have already been working in the Wixie student authoring tools, have them click the Wixie button and choose Home. To make the Curriculum Library more relevant to each teacher, ask them to click the Settings link at the top right of the Wixie dashboard. At the Activities Settings, have teachers check the box for the grade, or grades, they teach. They may also want to check the grades on either side to see additional activities that will help them better differentiate instruction for the learners in their classroom. Now, when they explore the Curriculum Library, it will only display activities connected to the standards and topics taught at, or near, their grade level. To help teacher gets a sense of the types of things students can do in Wixie, spend some time exploring the resources in the Curriculum Library. To view the Curriculum Library, click the Activities link on the toolbar. Show teachers how to use the folders on the left to browse the subject area folders to find activities as well as how to search by keyword or by standard. Be sure they learn how to use the Actions button and choose Customize to place of a copy of any activities they like in their My Projects folder. Provide time for teachers to explore the resources on their own. Have them save two to three activities in their My Projects folder and share these ideas with the group. This raises awareness of the standards-based resources in Wixie and shows different ways Wixie can be used for student project work. Note: In order to assign activities and templates, teachers need to have class and student data connected to their accounts. Many districts don't upload this data into Wixie until the week before school begins. If that is the case, you may be able to practice the process using the data from your class last year. 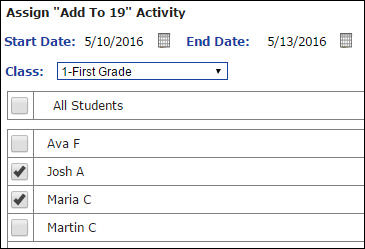 You can assign activities and templates so they appear in the student dashboard. At the Activities tab, ask participants to find and select a project they want to assign to students. Ask them to click the Actions button and choose Assign this Project. At the Assign Activity dialog, show them how to choose the dates it will be available for students to begin working, how to switch between classes if they have more than one, as well as how to select specific students to receive this assignment. Learn more about assigning activities. Be sure to have at least one student's log in credentials, so you can show them how students will see this assignment when they log in to Wixie. If you don't have student log in credentials yet, copy this image and show them how it will appear in the student's Project View in the Assignments area on the left. Students simply click the assignment on the left to begin working. Once students have begun the assignment, the project will show in the My Projects area on the right and they continue working by accessing it there. If you explore the Curriculum Library and assigned activities during your training, here are some links you might want to include in a follow-up email or wiki. *The next blog post shares suggestions for working with a cadre of master teachers to develop and share customized Wixie curriculum.